Over the years, playing with go-karts has been emerging as a great pastime for children. Go-karting is an established American habit, with both kids and adults loving it equally. 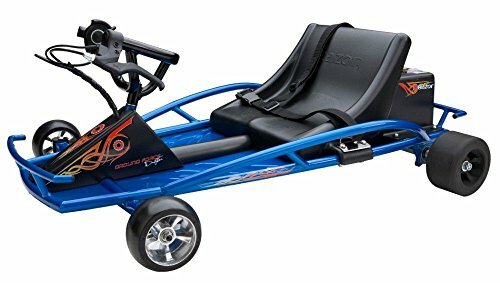 Kid’s designed go-karts are normally made of a sturdy frame with electric battery packs that make them heavy and hard for the unit to topple. They have a low center of gravity rendering them safer for children to drive. They are easy to master and control. 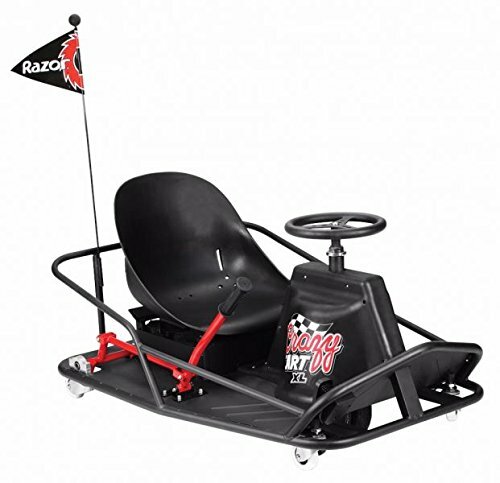 Here is a review of the top 5 Kid’s Go-karts Manufactured by Razor. Razor USA is a privately owned limited liability company that was established in June 2000. It is based in Cerritos, CA and it holds exclusive rights to the Razor Brand. 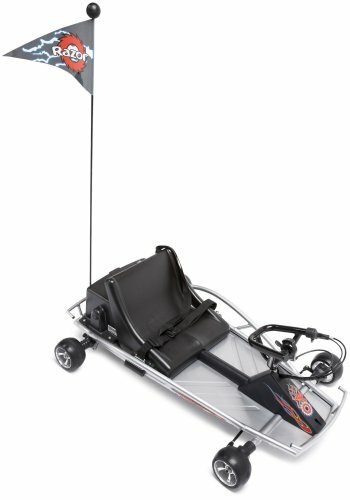 In addition to its unique kid’s go-karts collections, a razor is the manufacturer of multiple high-quality kid’s toys including scooters like E200, E100, E300, which are fully electric. In addition, Razor is the manufacturer of other kid toys such as Dirt Rocket, Pocket Mold, Pocket Rocket, + Ground force, and more. Here is a review of the top 5 go-karts from Razor. Aluminum wheels and four and a half inch tires help it cruise smoothly and quietly wherever it goes. It attains a speed of up to 12.0 mph, making it the perfect go-kart for cruising around cul de sac or flat trails. The speed chain is powered by two 12.0 volts batteries, which gives 45 minutes of the active drive on a single recharge. It features hand-controlled accelerator and handbrake that make operating it so easy. Its 29 by 16 by 41 inches ground force support drivers weighing up to 140 pounds. It comes with a ninety-day warranty. The buyer has to assemble the unit, but the required tools and an instructional manual are included. It is good to note that this go-kart is designed to run in controlled environments and not on public streets. Designed to carry weights of up to 120.0lbs and it can speed up to 9.0 mph. It features a Dune Buggy’s uniquely designed reduction drive that is perfect for lower torque navigation and off-loading. It’s fitted with 8” knobby tires and big bucket seats that support smooth and quiet riding. This go-kart is perfect for children of 8 years and above. Caretakers and parents enjoy the side roll cage, which creates a barricade between the outside and the rider. Its back seat is padded and it comes with a seatbelt for extra security. Its full electric design is arguably its coolest feature; it is eco-friendly, runs quietly, and is easy to charge. Other features that come attached include active rear suspension, diamond plate floorboards, 8-inch knobby pneumatic tires, hand throttle, safety flag, brake controls, and rear disc brake. 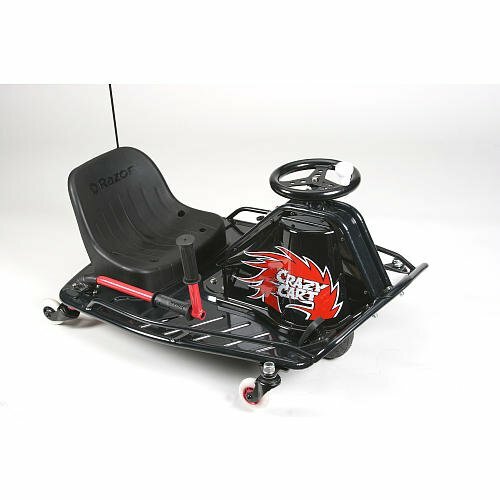 It is designed to bring to your home the fun of pro tracks and go-kart racing in a drifter fashion. It is packed with super slick rear wheels and race-tuned chassis that will easily make you your neighborhood drift king. It is designed with the need to make fast 180’s and power slide through corners and fish tales in mind. It features sturdy steel construction, aluminum wheels, and Razor has updated its rear axle to give it enhanced maneuverability steering. With its thumb trigger acceleration control, variable speed and hand run a rear brake, this go-kart gives the driver optimal drift control. Razor has also updated its drifter wheels to use molded aluminum wheels with rubber tires and slider POM rear wheels. What more, if you are out looking to buy a Kart that gives top speed, Razor ground force drifter kart offers you one of the best bet. It can speed up to 12 miles per hour. With thumb trigger acceleration, hand operated rear brake, and variable speed gives the drivers optimal drifting control. It is suitable for kids of 8 years and above. Its variable-speed motor is powered by 2-twelve-volt batteries which give about 40 minutes of active driving on a single charge. 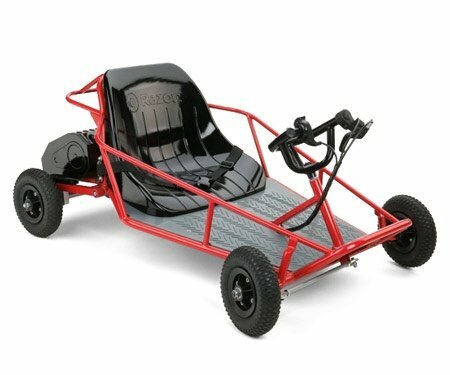 Other features that come with this go-kart include flag, steel frame, and a durable bucket seat with included shoulder seat strap. It is designed to support drivers of up to 140 pounds with an awesome 3 months warranty. The featured drift bar allows up to 360 degrees steering capability for variable speed foot pedal acceleration and tight turns. It can reach up to 12 miles per hour, and the battery can give up to 40 minutes of continuous use. It has a pneumatic front tire and anti-topple front caster wheels. Other features that come with this car include a flag, shoulder strap, and 2-twelve volt sealed lead acid rechargeable battery system with a charger. It is ideal for kids of 9 years and above and it will support a driver of up to 140 pounds. 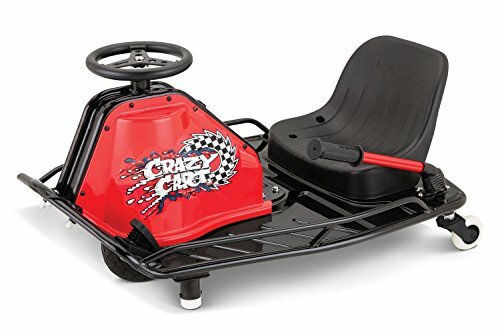 The buyer and driver of Crazy go-kart are responsible for knowing and following all local, federal regulations, and local rules regarding riding of Razor electric vehicles. It’s fitted with a unique drive system that supports maneuvering even when riding on the sharpest corners. Its upgraded drift bar helps it power through drifts in a way that gives optimal driving experiences. In short, Deluxe Crazy helps one hit 350 degrees turns and tight air spaces like a professional rider. In addition, it offers flexible maneuvering. The cart turns in multiple places and pivots, making it great for tight spaces. In addition, its full-size caster wheels offer enhanced handling. It is ideal for kids of up to 140.0lb in weight. It is fitted with Razor’s patented drift system that enables the driver to alter the rear caster angle so that you can drift or drive forward, diagonally, backward or any angle in between. It comes with drift bars allowing drivers up to 360-degree steering capability, pneumatic front tires, up to 40 minutes of an active drive on a single charge, variable speed foot pedal that accelerates up to 17 miles per hour, and anti-topple front caster. It comes packed with a flag and three 12.0-volt batteries. It is perfect for children of 16 years and above and it will support drivers of up to 240 pounds. It should be noted that buyers of crazy cart XL are responsible for observing state regulations regarding the riding and use of Razor electric vehicles and scooters. In conclusion, if you are out seeking to buy your kid a go-kart, click any of the above models. The links will direct you to the best price deals available. You will enjoy the purchase. Yoy may also like to read about Razor Dirt Quad.